Consider these planting ideas to soften the appearance of a sidewalk or finish a pathway garden. Flowering plant groupings make beautiful landscaped walkways. Growing short flowering plants along a pathway or at the edge of a sidewalk is an easy garden to create. This collection of ideas will prompt gardeners to add planting beds where none previously existed. Cottage gardens are traditionally filled with medium to tall plants inside a picket fence. An opening of ground between the garden and walkway provides an opportunity to add more plants. Short plants such as petunias, although common, are a good idea for long pathways. Trailing petunia plants quickly spread and the flowers are available in many colors. If the pathway is long, gardeners can edge the entire length of narrow garden space by repeating the same type of plant. Gardeners can add variety by growing a complimentary plant spaced every few feet. Walkways where visitors are liable to brush against plants are good locations for scented flowers. This is another reason to grow vertical plants along pathways. Annual plants are easy to grow in any type of garden. However, for small walkway gardens they are a perfect fit. The annual plant, marigold, can be grown by seeds or plugs and will fill in space. Economical and easy to use are two reasons annual plants are appropriate for any level of garden abilities. Here is an annual plant combination for a container in a small front porch garden. Coleus, an angel wing begonia and a new lime green sweet potato vine is one idea. The marigold blooms in yellow, orange, red or off white or in combinations of these colors and range in height from 10 inches to 36 inches tall. It is an example of an easy to grow flowering plant with much variety. Other easy to grow annuals include Lobeila, Alyssum and Nicotiana. Dianthus chinensis ‘Corona Cherry Magic Mix’ was named an All America Selection winner, in 2003. It grows seven to nine inches tall and has a mix of colors including solid red and solid lavender. The mix develops unpredictable patterns among the multi-colored blooms offering a varying display in the garden. Rock gardens works well with sidewalk edges where summer heat is an issue. Plants with succulent leaves work best in hot temperatures and sun. Grassy edged gardens can be cooler and allows more options for gardeners. Flowering plants with trailing growth habits will cover ground easily and offer massive color. Other flowering plants with feathery leaf structure and bold flowers can be considered where sun and temperatures are less intense. Plants with vertical leaf structure or a spiky appearance can be considered for a rock garden. Gardeners value ornamental millet because it attracts birds that eat the seeds; some of the plant’s cultivars have dark purple leaves. Festuca cinerea, commonly called blue fescue, has short bluish ornamental grass that gardeners find a challenge coordinating with other plants, but is popular anyway. It is easy to create gardens along a pathway. Flowering plants soften the hard edges bordering a garden bed. Gardeners can consider edging plants for kitchen gardens, as well. Looking for a garden path idea for your backyard? 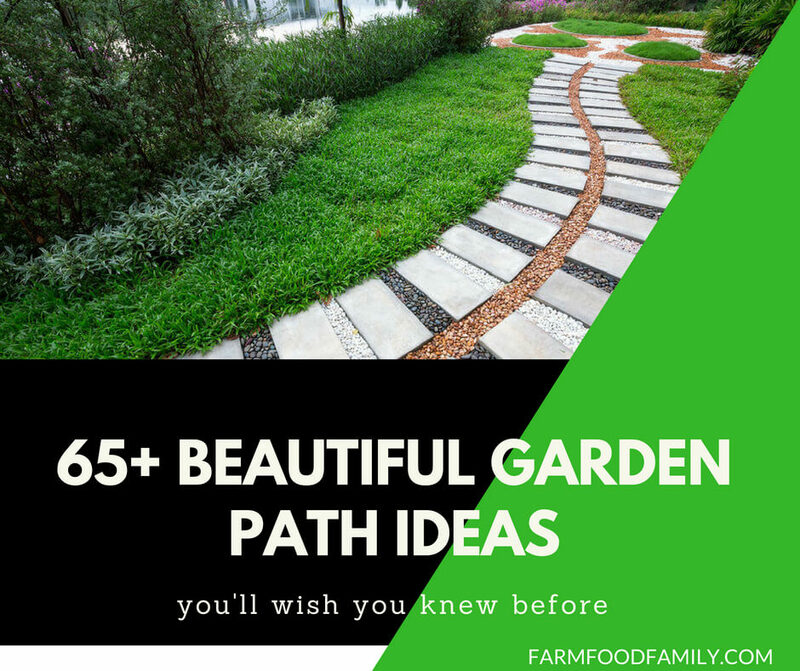 Check out these 65+ most beautiful and inspiring DIY garden path ideas (including small and large ideas). Decide what style you want for your outdoor space, or see if a particular style is suggested by the existing plant life and structures.